Goat willow at Sands Quarry (aka The Donkey Field) in the mid-90s before the devastation wreaked by the Ashfield Land company of Bristol in 1999 (see later pictures) - the devastation was a precursor to a development that never materialized thanks to the work of Jeanne & John Doohan and others in establishing rights-of-way across the land. Note that development issues from 2018 onwards may be found in the submenu Donkey Field development. 15th February 2017 - eighteen years on and it's devastation again at the Donkey Field/Sands Quarry. 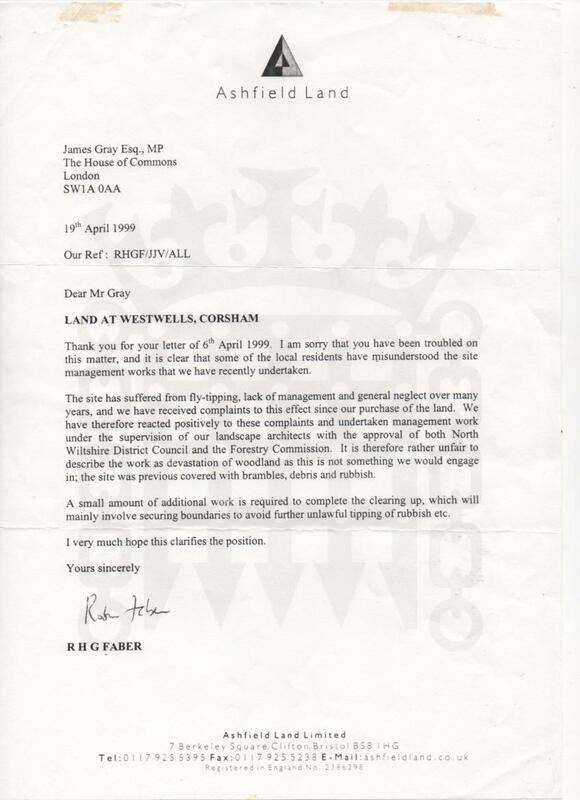 The 17th July 2015 article below describes the devastation wrought by former owners of the Sands Quarry site in 1999. Now, in 2017, it's deja vu all over again. In the past few days, the flora on this ten-hectare site has been ripped out and will leave, by the coming weekend, a wasteland. The following sounds a bit melodramatic, but you can see and hear the birds flitting about here not able to make head nor tail of what is going on. We will, presumably, shortly see a disingenuous planning application from the 'offshore' owners of the site via their local agent. It is mentioned elsewhere in these pages that the going rate for agricultural land (and this is effectively agricultural) for development in the south of England is £1 million/acre so this plot will be worth £24 million. This vast amount is of no consequence to locals of course as they will gain nothing from any dealings and development here. These rich pickings will further stuff the pockets of those least in need. With Ark Data's planning application for a further two massive data centres adjacent to this site and the 700 new homes approved between Pickwick and Rudloe/Hawthorn along with the substantial developments of Katherine Park, MoD Basil Hill and Wadswick Green retirement village already in place, west Corsham will be in desperate need of the breathing space which the Donkey Field has provided for the last fifty years. 17th July 2015 - following foiled attempts by the previous owner, Ashfield Land of Bristol, in the latter part of the last century to develop Sands Quarry, the new owner, Putney Investments, has been attempting through its local agent, CMS Group, to develop this 10-hectare greenfield (for more than fifty years) site. Interesting that, as with the Potley proposal from de Vernon, a registered address for the applicant company (Bridgemere Ltd) for the 2011 and 2012 proposals (N/11/01613/OUT and N/12/01289/OUT) at Sands Quarry is 'offshore' (the Isle of Man in this case). December 1999 and the devastation wreaked by Ashfield Land is still evident but somewhat hidden by the snowfall. The ecology of the site recovered to an extent evidenced by the ecological reports for the 2011 and 2012 speculative planning applications. Disappointing but perhaps unsurprising that CMS/Bridgemere, in the 2011 and 2012 applications, continued to use distortions similar to those used by Ashfield Land a decade previously vis "Since the site became vacant, fly tipping, trespass and vandalism have caused the site to become further deteriorated. The natural environment has also suffered due to lack of management and maintenance. However, the site does provide forgaing ground and habitat for a number of species, notably bats and parts of the woodland are covered by Tree Preservation Orders (TPOs). The Rights of Way are also well used. These positive elments of the site have been taken into account during the design, to make sure they are protected and where possible, enhanced". This misinformation is pure subterfuge designed to disparage the site for the purpose of gaining planning permission. The ecology of the Donkey Field and Sands Quarry recovered perfectly well from Ashfield Land's 1998/9 devastation, thanks to Mother Nature. 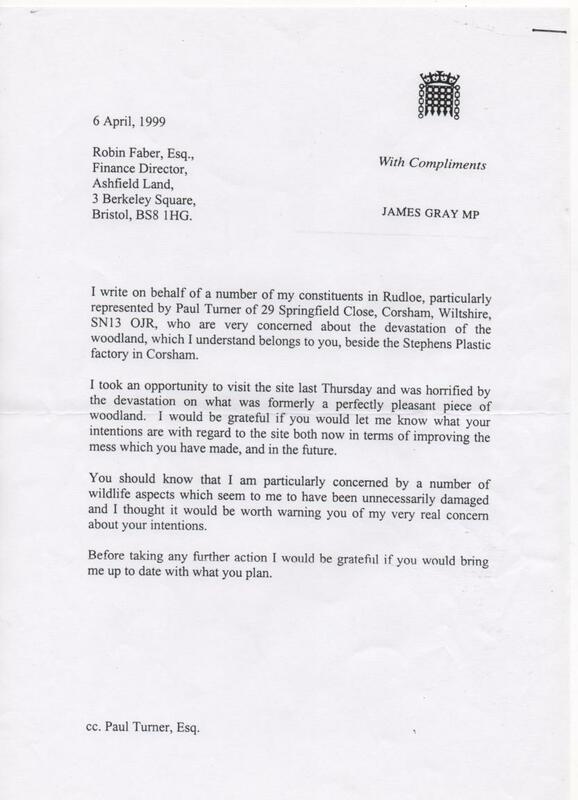 This is what developers did to "a perfectly pleasant piece of woodland" (see James Gray's 1999 letter to Ashfield Land in the file 'link' below). Ashfield Land said "We have .. undertaken management work under the supervision of our landscape architects"
"Updated plans to transform a 24-acre brownfield site near Corsham are to go on show to the public next week. People living near to the Sands Quarry site are being invited to look at revised proposals which include much-needed offices and recreational green space. The concept plans have been designed by local firm CMS Architects and will be on show at the Neston Memorial Hall next Friday between 3-7pm. An outline planning application has already been submitted to Wiltshire Council but this has been put on hold to allow the concept to be revised based on feedback received to date from the local community. The scheme would develop the former Second World War refugee camp and stone quarry which has stood empty for a number of years. At the centre of the proposals are plans for a small business park, including 10,000 sqm of office space for start-up and small to medium sized hi-tech businesses, as well as parking. The scheme would also incorporate enhanced pedestrian access along with improvements to the Westwells Road junction to restrict vehicle movements through Neston. Up to 70 per cent of existing green space would be retained for recreational use by local people, enhanced with extensive new landscaping and tree planting.Anyone not able to attend the exhibition can access the plans by visiting www.sandsquarry.co.uk from next Friday (17th July 2015)". Notice that the articles merely echo the disinformation "much-needed offices". Much needed by whom? A search for vacant office premises in north-west Wiltshire on the Invest in Wiltshire website (http://propertysearch.evolutive.co.uk/cgi-bin/db2www.exe/n29results.d2w/report) reveals 185 office or similar properties for rent in the area. Also, sites for new commercial/office development are already in the planning system - just two small examples: the Masrich Pension Scheme (within Hannick application 13/05724/OUT) commercial development on pastureland on the Bradford Road at Rudloe has been approved and a 1.3-hectare site at Methuen Park has been lying vacant for years awaiting a developer (see photo below). There is something seriously awry with our planning system when new, greenfield speculation is allowed to proceed when other brownfield sites lie vacant. The "public consultation" on the latest speculation takes place today, Friday 17th July 2015, at Neston Hall from 3-7pm. My advice would be to boycott the event as it will be purely used as a device to demonstrate to Wiltshire planners the extent of the public consultation for the proposal.